BRADLEY HAS SET OFF A STORM! Once more, the name of Bradley Manning is on everyone’s tongues, and pens and keyboards are fizzing as writers, reporters, all of us who were already supporters of him and his heroic actions and even the the msm, expound on what this extraordinarily captivating human being standing alone in a court room is drawing our attention to. For Bradley has, yet again from his captivity, succeeded in inspiring again and re-envigorating just those discussions, debates he hoped for. 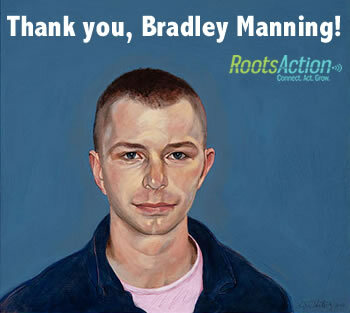 RootsAction are circulating a ‘thank you’ card to give everyone who is grateful to Brad the opportunity to express their gratitude for his sacrifice. And an indication of the impact his hugely significant statement has had, is that, even though he only read the statement in court 4 days ago, the thank you card already has over 20,000 signatures. You can sign it here. Much has been reported on Brad’s being an emotional wreck; a ‘mess’; a weird loner who couldn’t ‘fit in’ etc, and speculation (mostly from those who have either failed to read or lacked the ability to parse correctly those chat logs, which really couldn’t make it plainer…), has abounded in theories from this being the random act of a crazed individual to seeing it as an act of revenge against the military. For now we can all see that when this very able and commanding figure stands up and speaks, people listen. We are all agog. For Bradley is indeed a compelling advocate for the maturity of his act of resistance and renewal, and in the process, sends out a rallying call to action which is a great inspiration and encouragement to all of us. We have seen precious little of purity of motive in the last decade, and it’s all the more striking to feel the contrast between the dissembling and cynical spin which characterises public life and the humbly authoritative Bradley Manning and his sacrificial behaviour. “I hoped that the public would be as alarmed as me about the conduct of the aerial weapons team crew members. “cables were a prime example of a need for a more open diplomacy” that would avoid conflict and save lives. In some of these statements you get a hint of Manning’s empathy for fellow human beings. He described his conversations with an anonymous person at Wikileaks but made it quite clear there was no espionage conspiracy between Manning and Julian Assange. His statement made it much more difficult for the US to prosecute Assange under the Espionage Act.